I declare independence from my social calendar for a couple of days. As it’s summer, there is lots of parties and BBQs to attend. All good fun, but I need some time for myself! I declare my independence from home renovations today! I will not worry about getting the walls painted today, or calling the contractor to finish capping the windows. I will spend time with my family and just relax! AHHH! I love red,white and blue. Something about them as a combination just feels fresh! I’m declaring independence from negativity. I’m positive I can do great things and while they may not always turn out as expected their will always be a positive side to it. I saw somewhere a cute card that said “Bring your own sunshine” or something close to that and it’s been inspiring me a lot lately. Of course this has been twittered! And I’ll e-mail you soon 😉 You do amazing giveaways- thank you so much. Also- I just want to note. In my opinion, red white and blue aren’t just for the 4th of July 😉 – while Christmas, Halloween and Easter are seasonal, I feel like patriotism is not. BUT- I can see what you mean about having to store holiday items. I declare independence from being cranky. The weather has had me down, but I am alive! no more crankies!!!! Excuse me whilst i go get a midol…. I declare my independence from feeling guilty for not following every piece of advice and every parenting book or philosophy to a T. My baby will not spontaneously combust because I decide to let him “cry it out” nor will he implode because I think he needs to be rocked to sleep on another occasion. I’m free (!!) to make those decisions as a parent and if my hubs is happy with it so am I! Whew! That actually felt good! We live in an apartment that’s less than 400 sq. feet and I know exactly what you mean about storing out of season stuff (my mom is always telling e the place needs more “cheer” when Christmas rolls around). BUT I happen to love red, white and blue and decorate our house with it all year round so I can definitely make the space for patriotic fabric 🙂 Thanks for the giveaway and good luck with the ongoing de-stash at your mom’s place – I know it’s been a lot of work! I declare independence from Cleaning anything for the whole weekend! Thanks! and I !!! I just need some pampering ! I declare my independence from unhealthy foods — I truly will give fruits and vegetables the place of honor on my plate. I am declaring my independence from thinking I have to do everything without asking for help. Anyway, I SHOULD declare independence from griping, but I’m not in the mood :). For several years now, I’ve declared independence from the HAVE TO IMMEDIATELY syndrome. That stress of the immediate really takes it’s toll. I raised six kids and always put out whenever needed, now that they are older, I MAKE time for myself and do the things I WANT to do WHEN I want to do them. Sometimes I feel guilty for being selfish, but I was selfless for so long I figure I deserve/need it now. I enjoy my days! They are stress free and peaceful and fun! Anyone want to join me???? 🙂 Have a great day…I know I will. Going through all of that fabric sounds interesting. I can’t even imagine how much you are having to sort through. Hope you have a fun 4th of July! Apparently my mind has declared independence from itself! I have just been so forgetful lately! 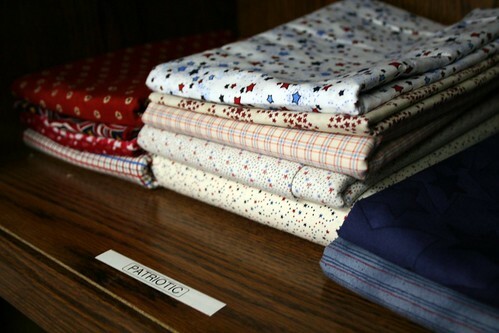 I would LOVE to win these fabrics! The ones you show are so lovely. I will be making a red, white and blue quilt for my son one of these days so these would be a perfect addition to my stash! I declare my independence from the crushing emotional burden or unemployment. I will no longer spend my days spend my days worrying about “what ifs”…what if we loose the house, can’t pay utilities, someone gets hurt, blah, blah, blah. I will no longer spend time trying to determine how long before before our finances hit the critical zone. I am not going to spend another moment living under a dark cloud and I will not wake up and cry in the middle of the night. I declare my independence from worrying! I’ve spent the past two days in a huff, and it’s time that I get over it! I declare independence from others trying decide what I’ll make next. I like to sew what I feel like sewing. I sometimes just feel like skipping around from one project to the next. It doesn’t matter to me who asked first no one is getting theirs until Christmas anyway!! I declare my independence from busy-ness…for the weekend, at least We got home from a crazy trip to TX last week and have still been going non-stop. Birthdays… 4th of July parties…I plan to just play tomorrow. No agenda. Ahhh…can’t wait. I am declaring independence from guilt. I don’t expect that will make it go away, but every reminder I give myself that I don’t HAVE to feel that way helps. So… today, I am happy to be who I am, and feel what I feel, and do what I do. Thanks for the giveaway, but thanks most of all for the independence-declaring challenge! I blogged this at Piecemeal Quilts. Oh, how I wish I could declare independence from perimenopause! Instead, I declare independence from STRESS. It seems to agravate the ‘getting older’ syndrome; all my decisions from this point forward will be made with one question in mind: will it stress me out?!!! I declare independence from feeling guilty for not doing it all. I declare that on Independence Day, 1976, I married my bestest buddy — and we celebrated our 33rd yesterday!!!! Here’s to many more, and continuing fun and adventure together!!! I declare my independence from being cold in the winter. I will plan ahead to go to a warm place for a few months and while still in Minnesota, I will dress warmer or stay inside.